Air conditioners tend to flounder when you need them the most – when it’s hot and sticky out. If you find yourself in this situation, call Bruce Jones Air Conditioning. 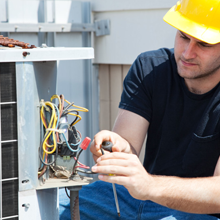 Our factory-trained technicians can have your faulty AC fixed in no time. Call today to book a service appointment! When you hire a technician to complete a repair, it’s understandable to want that repair done correctly. All of our work is 100% guaranteed in writing, for your convenience and peace of mind. We’re fully licensed and insured as well as factory-trained. Please call us if you have any questions. 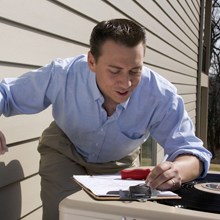 Regardless of what type of air conditioner your home has, our team can fix it if it’s not working the way it used to. Whether we installed your AC system years ago, or someone else did, our technicians can identify and fix the problems plaguing your system, because we have experience with all makes and models of cooling equipment. Call today to book your service appointment!